KOKOMO, IN – There's royalty walking around campus these days. Indy 500 Princesses, Danika Smith and Brittany Royer. 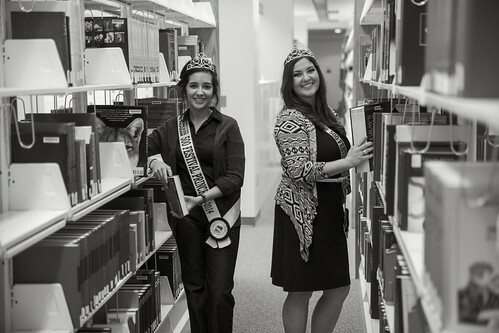 Danika Smith and Brittany Royer, both honors students at Indiana University Kokomo, are two of the 33 chosen to represent the state as 500 Festival princesses for the annual event. Nearly 300 collegiate women applied to be a festival princess. The Indianapolis 500 is the world's most famous auto race, and the 500 Festival Princess Program is no less prestigious than the race itself. In fact, the Princess Program began in the late 1950's, and has always sought out the highest-caliber Hoosier women. "The point is to find women who are motivated, unselfish, and personable," said Smith, a junior. "The Princess Program is a scholarship and ambassador program, not a beauty pageant." Royer and Smith were chosen as princesses based on their academic performance, community service involvement, poise, and leadership skills. Smith is student body vice president and Royer is Psychology/Psi Chi club president and Student Alumni Association vice president. Both girls believe that the leadership opportunities available at IU Kokomo prepared them for this experience. Through the Princess Program, Smith and Royer will not only advocate for the Indy 500, but IU Kokomo as well. Smith and Royer are direct examples of the quality students that IU Kokomo attracts and develops. "I hope that participating in the Princess Program will encourage women to never hold back from their dreams because of ethnicity," said Smith, who is of Hispanic descent. "Criticism has always pushed me harder to succeed and prove people wrong." As 500 Festival princesses, they will participate in community outreaches, ride a ceremonial lap around the track prior to the race, kiss the bricks, ride a float during the Festival Parade, and stand on the red carpet of the Key Bank 500 Festival Snakepit Ball. Not to mention, they are in the running for a $2,500 scholarship if one of them is selected as the 500 Festival Queen. However, Royer and Smith said that their focus is not on winning money or becoming queen, but participating in the events with fellow Indiana citizens. The girls will use their Princess outreaches to spark hype for the Indy 500, and visit different locations in their hometown, such as their old elementary school to talk to young students. One of Royer's activities will take place at IU Kokomo, and she will encourage other girls to apply for the Princess Program the following year. "To actually be a part of the events and race day activities is life changing. The Indy 500 is so important to the history of Indiana. I am especially anticipating the memorial service we have to attend because I come from a military family," said Royer, of Rossville. Smith, 20, from Arcadia, is most excited to work shoulder-to-shoulder with her fellow princesses throughout the month of May. Royer, a psychology major, and Smith, a public administration major, especially want their experience to inspire other Hoosier girls to move mountains. Royer's father encouraged her to apply for the Princess Program. During Royer's sophomore year of college, her father was diagnosed with a rare, incurable illness that motivated Royer to live her life to the fullest. "My dad and I love watching racing together. When I saw the Indy 500 princesses on TV as a kid, he told me, 'that could be you someday!' He has always been my biggest fan," said Royer, 23. Smith and Royer believe that being ambassadors for the Indy 500 also means being ambassadors for the very core of Indiana heritage and tradition. "We want to make Hoosier pride infectious through the Indy 500 Princess program. Through this program, I know that I have made 32 new lifelong friends," said Royer. Story written by Alexis Nash. Alexis is an intern in the office of Media and Marketing.